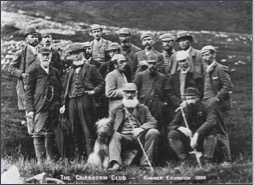 The Cairngorm Club has been associated with the North East Mountain Trust since the latter's inception in 1980. Sharing the many of the same hopes in the protection of the wild lands of the local countryside in the North East of Scotland, and further afield, the two organisations co-operate on many projects. These include protesting at the irresponsible spread of hill tracks across the high ground, the monitoring of hill paths, and resistance to the spread of intrusive construction or development in sensitive areas. Formed in 1887, the Cairngorm Club is primarily for active hill lovers, and today caters for the interests of its members by having both weekend and day meets on a monthly basis and for different ability groups in the immediate area and further afield. In addition, the very active Climbing section holds weekly meets indoor at Transition Extreme in Aberdeen, as well as outdoor training at the cliffs available at the coast and elsewhere. An additional mid-week walk is also held on the last Thursday of every month for those fortunate to have the time free. Periodic expeditions abroad are also organised, e.g. to the Alps and Spain. Individual members organise their own informal meets to include canoeing, mountain biking, snow climbing and skiing. Many members take an active interest in the flora and fauna of the Cairngorms and other mountain areas both at home and abroad. From October to March, indoor talks are arranged to include an informative and social side to the club. There is a regular BBQ arranged in June, an annual Dinner in November, and a Burn's Supper each January at Muir (see below). And we mustn't forget the occasional "Dander"- a short walk and lunch organised for the less fit but still active members of the Club. October 2014 has, in addition to regular events such as those above, a Dander (at the Bennachie Centre) and the first of the season's Indoor meets about the Cairngorms Outdoor Access Trust. External training is encouraged and subsidised by the Club, and includes mountain leadership courses, navigation and first aid. The Club contributes regularly to Mountain Rescue organisations and finances several ongoing projects such as "Pipers Wood"ensuring the survival and regeneration of an area of trees up Glen Ey. This successful project is being expanded,and should ensure the biodiversity in an area overgrazed by red deer. The Club is lucky to have its own "hut" at Muir near the Linn of Dee. This asset is one of the best appointed self-catering climbing huts available in Scotland, and through the MCofS provides other clubs and organisations a comfortable facility in the Southern Cairngorms. The Club also benefits from the reciprocal arrangement that other clubs huts are available to it, and these are often used as bases for the weekend meets. 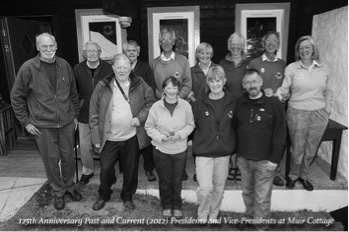 The Club runs its own website (www.cairngormclub.org.uk) and members-only Forum, and, in addition, provides regular paper newsletters to all members. The Club usually sends representatives each year to the Mountaineering Council of Scotland AGM to take part in the discussion and voting. The Cairngorm Club Journal is a longstanding occasional periodical providing both authoritative articles on scientific, historical and cultural issues, and lighter descriptions of mountaineering exploits. A complete set is housed at Kings College in the Club's substantial library of books. Although sharing many of the North East Mountain Trusts views on protecting the environment and educating people on the importance of doing so, the Cairngorm Club is committed to providing its members with assistance in visiting those sensitive highland areas. However with many of the NEMT's shared goals, it emphasises the responsibility to care for the environment. Back row L-R: Edwin Martin (Pres 1988-91), Eric Johnson (Pres 1982-85), Anne Cordiner (Pres 1985-88), Ken Thomson (Pres 2000-2003), Judy Middleton (Pres 1994-97), Gill Shirreffs (Pres 1991-94), Richard Shirreffs (Pres 1997-2000), Eilidh Scobbie (Pres 2006-09). Front row L-R: Graeme Ewen (Hon Pres), Marjory Ewen (vp), Anne Pinches (Pres 2009-12), Derek Beverley (vp).